What do you guys think? I love how vibrant these colors are! You'd almost think it was summer. Wishful thinking from the girl in a blizzard. My first successful watermarble of 2015, maybe this'll be the year where I finally marble my brains out correctly! I can only hope, haha. Of course I had to whip out my Pipe Dream polishes aka the holy grail of marble polishes. I was very lucky to snag these when I did, because even months after release they are still selling out like hotcakes. For this particular marble, I used the following colors from the Night in Vegas Collection: v.i.p. pass (purple), all in (blue), and high roller (green). Personally, I find the 'flower' type of marble to be my favorite and easiest to create. I wanted to make a video, but couldn't find my camera and was running low on time. I'll definitely shoot a video soon though on how I like to get my watermarble on. As I mentioned before, these were actually bestie triplet nails done with the talented Shawna of Mom, Mrs, & Me and Makenna of Pinkies For A Penny. I love how our collage looks together! From our different results to our different nail lengths, it's amazing! 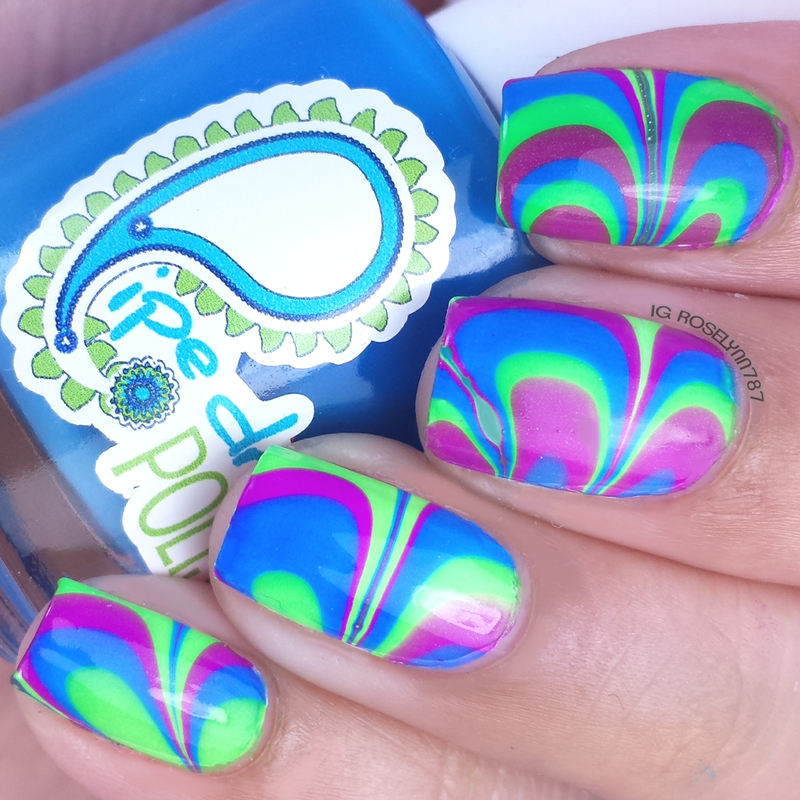 It just also shows you guys, there is never just one way to do a watermarble. Thank you so much Shawna and Makenna for doing these with me! So guys tell me, how do you like watermarbling? What are your favorite polishes to use for this technique? I adore your manicure! It's so gorgeous! I've seen marbles with these polishes and every time I do I lust over the collection a little harder. Ugh, I hate it when things are so hard to get your hands on! Just wow. I love those colors!!! Gorgeous!!!! Wow this looks absolutely amazing. I always wanted to try it but never sure whether or not I should do it. I love the color choice! They all turned out so well! Gotta love a good water marble. Yours came out perfectly! Super cute! I'm a sucker for those colors! These are awesome. I have never been able to get a marble to work. I'm not patient enough. 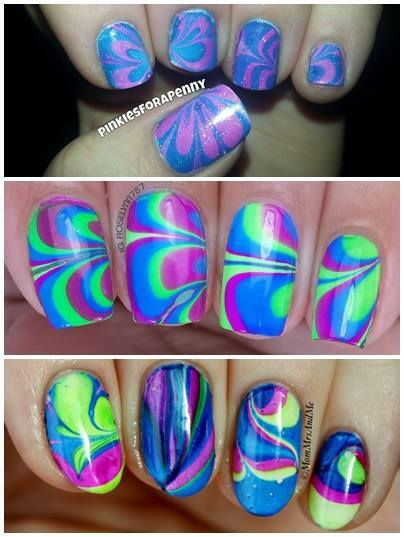 Fantastic water marble! The colours are so bright and happy! These look awesome!! I really need to get my hands on that collection!! All three are super cute! These polishes have been on my wishlist forever but luck is not on my side when it comes to restocks! Fantastic! Gorgeous combo of colors! Fantastic! I love this marble so much! 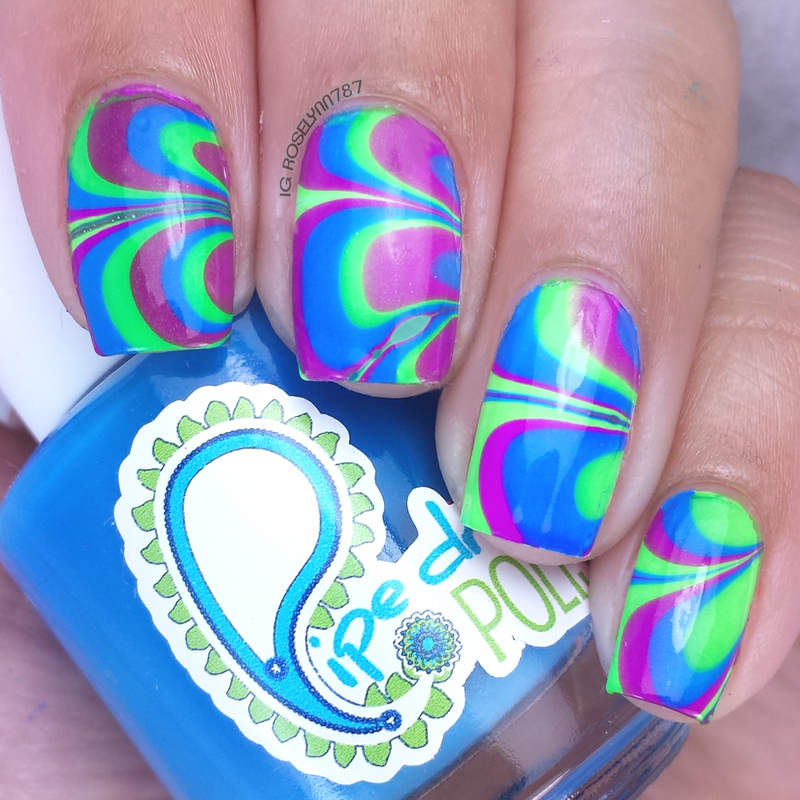 Loved the colors and how pretty your water marble looks. Pipe Dream polishes definitely look great in water marble nails. My second choice is Sally Hansen nail colors. Your marble is beautiful! I love how it turned out. I have a love/hate relationship with watermarbling. I think practice is what I need to get better, but I haven't found a way to be more efficient with it yet. Just kidding!! I love these! The color is so great! Beautiful marble! I really want to get my hands on these someday. I've been hearing lots of good things about Pipe Dream lately, now I see why! Very vibrant! hey u have done great job! love it !